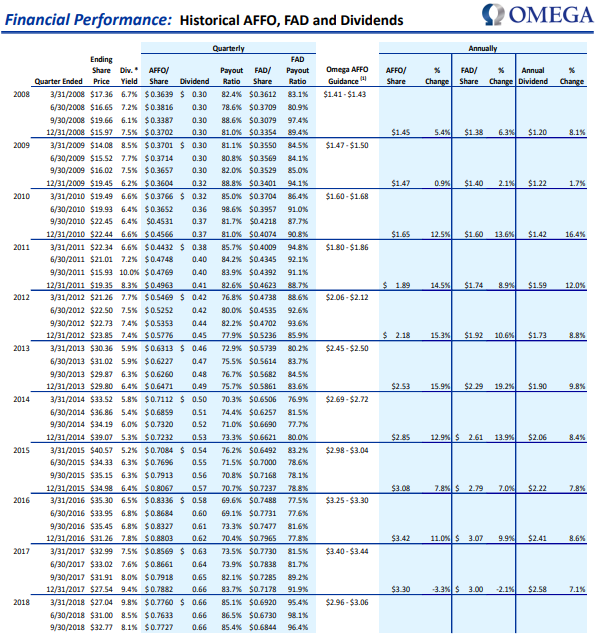 This week’s Blue Harbinger Weekly digs into specific investment ideas following the powerful market-wide “flight to quality” since October, including a detailed review and trading idea for big-dividend (7.3% yield) REIT, Omega Healthcare Investors (OHI) which is now up 44% year-to-date while the S&P 500 is essentially flat (do you think Omega is Overbought?). We also review the names on our Income Equity watchlist, as well as the results of an attractive Growth Equity stock screen, we provide an update on our market-wide health score, and we conclude with some ideas about how you might want to position your investment portfolio going forward. When Will The “Flight To Quality” End? the assumption seems to be that because we've seen weakness in stocks, oil, high yield bonds, etc., we are in danger of an outright bear market. Mr. Market sees some clouds forming on the horizon and that’s what's driving the flight-to-quality trade. Realty Income’s (O) recent strong performance is certainly consistent with the current “risk off” environment, and that’s exactly why many people own high quality REITs in the first place. But is the flight to quality trade overdone? Is it time to move some of your chips around? We absolutely advocate sticking to your personal long-term investment strategy, but that doesn’t mean you can’t be opportunistic on the margin. According to Ariel Santos-Alborna, The Great Rotation (from Growth To Value And Risk-Off) may be underway. Ariel provides lot of good data to support his thesis, and it’s something we keep on our radar for risk management purposes. However, as Dr. Steenbarger says, “Maybe” a big market change is underway. And depending on your individual situation, we’ve highlighted some stock-specific opportunities, and dramatic recent stock price moves, in the next section, for you to consider. The following table includes a list of high income securities that we follow (many of which we have written about, in great detail, in the past). These securities generally offer large dividend yields, and many of them have sold-off over the last month as the market has sold-off (although they haven’t sold-off nearly as much as the names on our Growth Equity list, which we will share later). One of the first thing to note about this list is the large dividend yields. For example, we’ve had success owning 12% dividend yield New Residential (NRZ), which has recently pulled back in price. We’ve written about NRZ previously here, and encourage investors to consider the risks before investing. We also currently own Omega Healthcare (a top performer in the table), which we cover in detail later in this report. Also worth considering, we ran the following list of more-growth-oriented stocks that had been performing so well this year, that they’re still up sharply year-to-date, even after selling-off dramatically in recent months as part of the market-wide flight-to-quality. 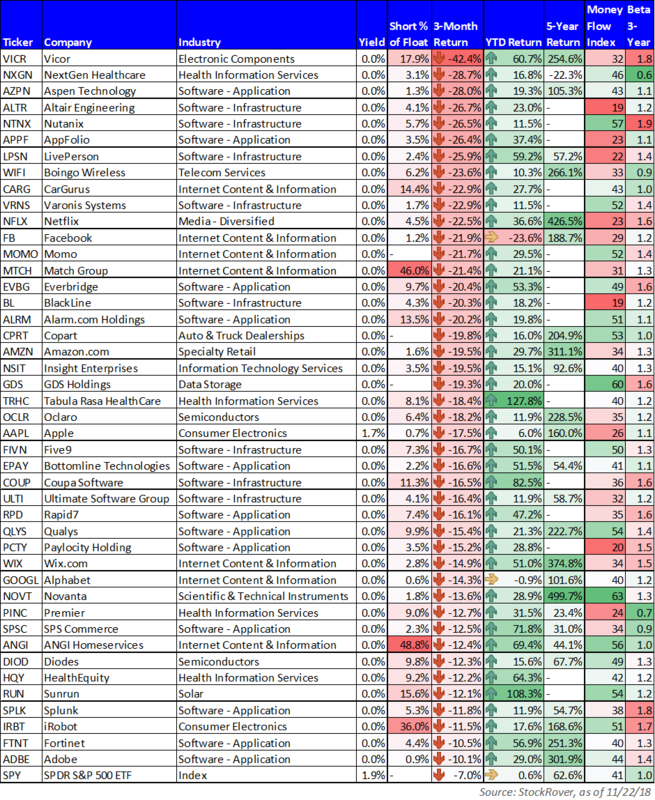 The list includes big-movers in the technology, consumer cyclicals, and information services sectors (because they tend to contain many of the higher beta growth stocks), but we’ve also been sure to include the FANGs, and it’s still hard for us to believe names like Netflix (NFLX) won’t continue to grow rapidly and experience some powerful price reversion back much higher in the future (Netflix is still up 36.6% year-to-date, even after selling-off 22.5% over the last 3-months. For perspective, the S&P 500 is at the bottom of the table, and shows just how much more volatile the other stocks have been relative to the overall market. Also, if you’re wondering, the “Money Flow Index” in the table is a technical measure of price and volume, or money flow over the past 14 trading days with a range from 0 to 100. A MFI value of 80 is generally considered overbought, or a value of 20 oversold. 3. Stock of the Week: Is Big-Dividend REIT Omega Healthcare Overbought? Big dividend yield (+7.3%) REIT Omega Healthcare Investors (OHI) has been on fire this year, gaining over 44% year-to-date. Granted, the shares have been rising from a low base (related to distress among many of its large operators). However, the company’s recent upbeat earnings announcement, combined with the market-wide “flight to quality,” has benefited the shares significantly. And by many measures, the shares are now approaching “way overbought” levels in the short-term, irregardless of your views of the stock over the long-term (for the record, we like Omega as a long-term income-investment, and we continue to own the shares). As long-term investors, and before we get into the details of our recent short-term income-boosting Omega options trade (spoiler alert: we sold very attractive covered calls), it’s worth reviewing the current fundamentals behind Omega’s business. Omega is a healthcare REIT, focused on skilled nursing facilities (SNF"), and despite favorable long-term demographics, many of its SNF operators have been struggling financially, to put it mildly. As a result, Omega has temporarily halted dividend increases, and has been focused on disposing of certain properties to generate near-term cash flow instead of focusing on long-term growth. As a result, many of Omega’s critical financial health metrics have reached precarious levels as shown in the following table. And as a result of the precariously high dividend payout ratios and negative Funds From Operations (“FFO”) growth, the shares had understandably sold-off dramatically (before the recent sharp rebound). Specifically, many Omega analysts and pundits were expecting the worst, however Omega remained positive and upbeat in its last two quarterly earnings announcements, and the shares have rebounded dramatically. For example, here is a very encouraging statement from Omega’s CEO during its most recent quarterly earnings call. With the bulk of our asset sales and repositioning behind us, we expect that in 2019 acquisitions will meaningfully outpace dispositions, as we return to our historical growth model. However, in perhaps a new chapter to the recent Omega drama, the shares are becoming dramatically overbought by many technical measures. For example, the 200-Day moving average and 2-Week Money Flow Index show Omega’s overbought levels are increasing sharply while much of the rest of the market (e.g. SPY and QQQ) is moving in the other direction and becoming oversold. Because we remain bullish on Omega’s long-term prospects (we own shares), but recognize the potential short-term headwinds, we have elected to sell income-generating call options on our existing Omega position. This generates attractive income for us now, and if the shares continue to rise significantly (before our options contract expires on January 18, 2019), they’ll get called away from us (our strike price is $38) at an even larger profit than we already have in the position. And if they don’t get called away from us before the options contract expires, then we’re happy to keep holding the shares for the long-term, plus we get to keep the attractive premium income we just generated for selling the calls, no matter what. And worth mentioning, the premium income currently available is higher than usual because market volatility and fear is also higher than usual, as evidenced by the heightened VIX (more on the VIX, and overall market health, later). For perspective, if the shares get called away from us within the next 2 months (when the contract expires) that’s an extra 35% income for us on an annualized basis (((($38+ $0.40) / 36.28) -1) x (2/12 months) = 35%). We believe Omega remains an attractive long-term investment despite the climbing near-term technical levels. And as a long-term investor, we view now as an attractive opportunity to boost near-term income with covered calls. Further, if you enjoy the idea of boosting your income with covered calls, Dr. Jeff Miller has been running an outstanding series on boosting your income with calls, and his latest is available here: Boost Your JM Smuckers Dividend Yield. Despite the recent spike in volatility and fear (as measured by the market “fear index,” the VIX, aka CBO Volatility Index), and despite the recent market-wide sell-off (which has been more pronounced for technology, growth and momentum stocks versus “fight to quality” stocks—such as REITs), long-term market conditions remain healthy. However, in the short-term, volatility is persistent, and risk is elevated. Remember, the risk-versus-reward trade-off is one of the most basic tenets of investing. Specifically, if you take more volatility risk—you should be compensated, over time, with higher returns. Therefore being a contrarian and “buying low” after a sell-off is often a better opportunity if you are a long-term investor. However, there is certainly no guarantee that the market won’t go much lower in the short- and mid-term. And if you cannot handle the shorter-term volatility (or if you are in a comfortable financial position where you don’t need to take on the volatility risk), then there is really no need to take on that risk with your investments. Worth noting, from a short-term standpoint, negative indicators include an elevated Volatility Index (VIX), and an uptick in credit-spreads (which are still low by historical standards), which are both indicators of near-term risk as volatility is persistent. Also interesting to consider, Yield Hunter reminds us that there have never been so many investment grade bonds approaching junk status. From a long-term standpoint, positive market health indicators include an increasingly attractive S&P 500 forward P/E ratio, low unemployment, low interest rates (even though they are rising), and continuing GPD growth. Overall, despite elevated near-term risks, the market remains relatively healthy and attractive from a long-term investment standpoint. The risk-off flight-to-quality in recent weeks has been quite pronounced as fearful investors ditch volatile high-growth stocks in favor of lower-risk lower-beta securities including REITs such as Omega Healthcare. Not only has the market’s preference for REITs helped Omega’s share price, but so too have the company’s last two earnings announcements which were both very positive especially relative to the dire operator challenges the company has faced (and been working through) over the last year. We like Omega over the long-term, and we continue to own the shares; however, we recognize the increasingly overbought technical indicators for Omega in the short-term, and we’ve elected to sell income-generating call options against our shares for the reasons described in this article. More broadly speaking, near term market volatility has created some attractive investment opportunities across the market, such as those described in this article. It makes sense for investors to be opportunistic around the margin (i.e. pick up a few attractive shares at discounted prices if it is consistent with your investment time horizon and goals), but don’t ever do anything crazy like ditching your long-term plan out of fear or greed. Be smart. Stick to you plan.